The opening concert of the BBC Symphony Orchestra on Friday 1 October 2010′ had a strong programmatic thread running through it. And like all good concerts, the programme spoke on more levels than merely just quality of the playing or the interpretation of the music. The concert’s undeniable success was in spotlighting two different takes on death. Wagner doesn’t so much confront the darkness so much as embrace it. His obsession with love and death summed up exquisitely in the Prelude and Liebstod from Tristan and Isolde. But Wagner’s music – all encompassing as it is – is hugely self-indulgent, or at least feels that way. At other times the composer’s willingness to be public about the intensity of his emotions in his music can feel intimidating. I’m getting close to loving Wagner. I haven’t quite got to that point yet. In comparison, the second work on the programme by Peter Lieberson was a stark contrast in terms of intimacy. His setting of five sonnets by Pablo Neruda, as beautiful and moving as it was manageable in terms of scale. Scored for voice, strings and harp this was a slightly less enormous kind of love. The work didn’t suffer because of it. More, on a first listen – this was the UK premiere – Lieberson simple yet effective settings touched deftly. Soloist mezzo-soprano Sarah Connolly was a great choice. Her rich, engulfing tone combined with the orchestrations of Lierbson’s music created a sound world difficult to leave behind, reinforcing both composer, his muse, the work’s initial performer and the intensely personal sentiment. A rare achievement for a piece of contemporary music. Here’s an audioboo during the concert interval. 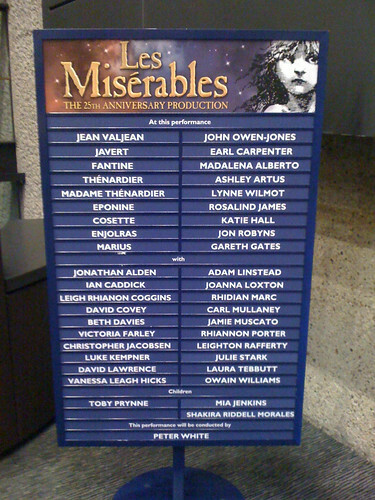 The all-too-brief run of the touring production of Les Miserables at the Barbican Theatre, London comes to an end next week. And when it does, the company should feel justifiably proud of their achievement. The first night definitely set the bar very high. Not only did casting the show from previous productions ensure the quality of the musical performances remained high throughout the Barbican run, but the combination of stylish set and lighting designs reinvigorated the reputation of the work as a whole. This is how musical theatre should be. All the time. Musically, Les Mis isn’t the pappy sentimental work most might assume. Aside from the the ubiquitous songs like “Empty Chairs”, “Master of the House” and “Bring Him Home”, composers Boubil and Schonberg’s writing is tricky to execute vocally and instrumentally. Whilst the pop opera might be devoid of the more traditional recitative, the demands placed on performers by the composers when they’re charged with moving the plot along are considerable. This is no ‘easy sing’. And that’s where the cast’s experience really paid off. For the majority of the show such investment seems effortless. The audience takes it for granted. The pace is established at the beginning of the preamble. We are completely sucked into the action. Good singing is a given up until the showstoppers, when we’re suddenly reminded of just how accomplished those performers are. John Owen-Jones delivers a refreshingly ham-free rendition of “Bring Him Home”. The deft casting of the young Cosette succeeded in avoiding the schmaltz which usually exudes from “Castle on a Cloud”. Earl Carpenter made the crowd roar with appreciation with his faultless delivery and terrific control and projection of “Stars”. Gareth Gates too, continues to prove his mettle. These key performances, combined with the superior scoring and the inventive effects used to visualise underground Paris and Javert’s demise made the standing ovation at the end of the two and three quarter hour performance a foregone conclusion. But there’s another – slightly darker – success this production has achieved. It’s thrown light on the London production of Andrew Lloyd Webber’s Phantom of the Opera. I saw it for the first time a few weeks ago. Whilst Les Mis predates Phantom of the Opera by 6 years (the former premiered in Paris in 1980), both shows have run in the West End for around about the same time – Les Mis for 25 years at The Queens Theatre and Phantom for 24 at Her Majestys Theatre. Les Mis – and especially the Barbican run – steams ahead in terms of musical integrity and production. Phantom in comparison feels creaky, in terms of plot, music and production. The scene changes are noisy. Some of the ensemble numbers feel a little raggedy. The set is in need of a redesign too. And whilst Lloyd Webber’s score offers a collection of set-piece crowdpleasers throughout the first half (which no doubt pulls in the crowds night after night), its lack of pace makes the interval seem like a lifetime away. The relative speed of the second half is – pretty much – because there’s a bit more going on. But in spite of this, there’s no investment in the characters in that there’s no feeling of jeapordy during or redemption at the end of the show. Despite it’s ongoing popularity and box-office success the Phantom production now appears like it needs a massive injection to either kick-start it or bring it painlessly to its end. It is crying out for reinvention, especially in terms of set design. Unfortunately, the Barbican production of Les Mis just made that more obvious now. The discussion chaired by presenter Mark Lawson also featured the Chief Executive Incorporated Society of Musicians Deborah Annetts who called for an industry wide standard policy on the thorny issue. This isn’t a new problem. Professional musicians have long mumbled about how some airlines fail to take care of large musical instruments such as double basses. They were doing it when I was an orchestral manager in the mid-90s. Tours were the cause of much stress as a result. And rightly so. Those very instruments are vital to a musician’s work. But with the advent of social media and the rise of an airline whose marketing strategists remain unabashed at such ideas as charging for using the toilet, implementing a charge for overweight passengers or introducing a stand up seat, those riled by Ryanair’s policy on musical instruments in the hold and in the cabin are galvanised. The Facebook group Musicians against Ryanair has been gaining momentum for most of the year. Its membership now stands at 13,729. That’s quite a lot of professional musicians asking for change. It’s claimed the airline now levies an additional charge for those musicians whose instruments go over the weight allocation for each passenger’s hold luggage allowance. Not only that, it seems that in some cases musicians who previously had been able to take their smaller sized instruments on board as hand-luggage are now being asked to purchase an additional ticket. Ryanair isn’t the professional musician’s airline of choice at the present time. Even young aspiring musicians aren’t exempt either. Interestingly however, young violinist Francesca Rijks who was told by Ryanair to buy a £190 ticket for her violin who missed her flight when her parents attempted to book the seat, ended up having a better experience with rival budget airline EasyJet who let the 12 year old take her instrument on board their service as hand luggage. Only today on my return EasyJet flight from Barcelona I spied a professional violinist storing her instrument in the overhead lockers in the cabin. Francesca Rijks wasn’t a one off. If EasyJet can allow suitably sized musical instruments on board as a piece of hand luggage, couldn’t Ryanair? The picture used in this blog post is called “Stolen Violin”. It was published by Flickr User Luz A Villa and is used here in accordance with the terms of the Creative Commons License. The thoughts of a collection of marketing peeps feature in the final BBC Proms video for 2010, including contributions from Alison Atkinson (London Philharomonic Orchestra), Jo Johnson (London Symphony Orchestra), Will Norris (Orchestra of the Age of Enlightenment) and Tom Service (BBC/Guardian). This was an incredibly special evening. Both me and my Significant Other knew it would be so the moment we knew we’d secured tickets to the night. But it wasn’t until Simon explained to me prior to the concert what he was looking forward to, I was reminded about one crucial thing. Sunday In The Park With George was the show he and I (with a handful of a close friends) went to go and see hours after we’d signed our names on our civil partnership in 2006. I was suffering from indigestion for the first half. I’d devoured an entire cheese course. I couldn’t help myself. But it was Jenna Russell’s performance in the Menier Chocolate Factory’s production at the Wyndham Theatre that day which made the day. We were in the second row. Her performance was stunning. We cried. She cried. Everyone cried. No surprises then that come the reprise of the numbers from Sunday in the Park with George – especially Jenna Russell’s performance – that things got a little bit emotional in the loggia box where we were sat. A reprised performance conjured up romantic memories of what had been a deliberately low-key day for us in the company of closest friends. I’d been introduced to Sondheim’s music by Simon shortly after we met. Seeing a Sondheim show to mark our civil partnership was both lucky (the production was quickly sold out in 2006) and seemingly ‘right’. To then be reminded of that day at the Prom made the whole concert seem like Christmas Day. Sondheim’s score for Sunday in the Park is his most mature writing. It sounds it. His lyrics too have a dryer perhaps even more satisfying humour than the pantomime Into the Woods or Forum, making the entire thing seem like a Phd in comparison to the degree level Sweeney. There was even beauty in coincidence too. When Russell sang about it being ‘hot up here’ and a bead of sweat sliding down her neck, wilting audience members nodded in agreement. I’m a Sondheim fan – though not an expert – so what with that and the personal ties with the past, I found it difficult resisting the temptation to record a cheeky snippet from Sunday. For God’s sake, don’t tell Roger Wright I captured this. If Russell eclipsed the top-billing of Dame Judi Dench singing Send in the Clowns (it was a brilliant tear-jerker, although we knew it would be anyway), then tenor Julian Ovendon singing Being Alive did the same over Bryn Terfel. The latter’s operatic style seemed a little too big on stage in comparison to the more modest but plausible musical theatre performances provided by other members of the company. Over-acting is easy just as it is easy to spot too. Maria Freedman playing Mrs Lovett was the perfect foil to this in the Sweeney duet showing all the black humour the role demands. Having said this, nothing really detracted from what was in Proms terms was an incredibly special night. It was lovely to be in a space with so many others who shared enthusiasm for Sondheim’s work. The performance on stage was polished and executed by people who clearly demonstrated their love for the composer not only in their performance but also in the welcome they had for him when he stepped onto stage at the end of the concert. And that welcome was magnified during the standing ovation he received from the audience too, something I’ve never seen at the Albert Hall. :: Watch members of the BBC Concert Orchestra perform Stephen Sondheim’s Take me to the World.